The All Progressives Congress leaders, including a former governor of Lagos State, Asiwaju Bola Tinubu, on Monday at the presidential rally of the party in Maiduguri, took turns to berate former President Olusegun Obasanjo over his latest attack on President Muhammadu Buhari. Obasanjo, had in a 16-page statement, likened Buhari to the late military dictator, Gen Sani Abacha, over poor leadership and Impunity. But at the APC rally, Tinubu described Obasanjo as an expired leader, who should not be trusted, adding that Obasanjo’s government was notorious for election rigging. The APC National Chairman, Adams Oshiomhole, also lambasted Obasanjo, saying the ex-President was watching when the Peoples Democratic Party government was stealing funds meant for fighting Boko Haram. The Director-General of Buhari/Osinbajo Campaign Organisation and the Minister of Transportation, Rotimi Amaechi, recalled that when he was a governor in Rivers State, the Obasanjo’s government withdrew his security detail. Tinubu, who is the APC Campaign Co-Chairman, highlighted the barrage of attacks on Obasanjo, saying the ex-President should have retired to his farm in Ota and remained quiet. 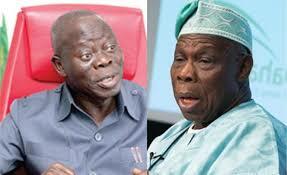 He said, “It is unfortunate that expired leaders like Olusegun Obasanjo are ranting and lying. Don’t trust him. We are sweeping all the cobwebs of corruption away with broom out of Nigeria. Ota farm should be enough a retirement place for Obasanjo to keep quiet. “Who among Nigerians will recall how the PDP government under Obasanjo was notorious for rigging elections? No government has upheld the tenets of democracy like the government of President Buhari. We asked for the recognition of June 12 from Obasanjo, he refused, but President Buhari as an honest man with integrity heard our cry and recognised June 12. Tinubu noted that four years ago the APC had promised to take the ship of Nigeria to the right direction. This, he said, the party had done. APc chairman claimed that Obasanjo’s attack on Buhari was borne out of frustration. He said, “The people writing epistle now watched how money meant for security was appropriated by not only the PDP but the generals. Under their watch, over 20 local government areas of Borno State were taken over by the Boko Haram terrorists before the coming of President Buhari. Amaechi also said under the PDP government his security detail was withdrawn, while he was chased out of the country by Obasanjo. He urged Nigerians to compare the administration of the PDP with the current government of Buhari and decide which was closer to Abacha’s government. But the PDP on Monday attacked President Buhari for allegedly hauling insults on to respected leaders and elder statesmen, including Obasanjo. The PDP National Publicity Secretary, Kola Ologbondiyan, in a statement stated that in approving his media aide, Mallam Shehu Garba, to allegedly cast aspersions and insult on Obasanjo, Buhari was setting a very bad example to younger Nigerians. Former President Olusegun Obasanjo has attacked President Muhammadu Buhari, saying he is sick in the spirit, body and soul. 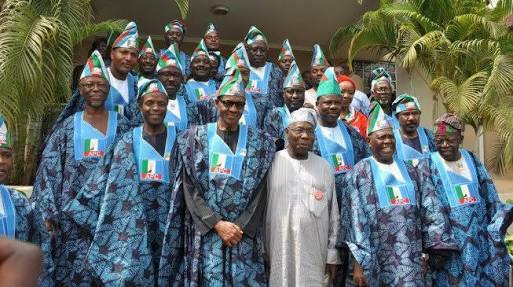 Obasanjo said, “Buhari is sick in the spirit, body and soul. Let’s beg him to go and rest. He has tried his best. Let give chance to another person.